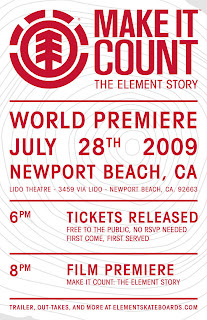 The Element Story, Make It Count, Premieres in Newport Beach, Calif., July 28th. It's free to the public, so stop by and check it out. Follow the link for more details: http://www.elementskateboards.com/makeitcount/events/.